For other ships with the same name, see HMS Grenville. HMS Grenville, was a schooner built in Marblehead, Massachusetts, and originally named Sally. The ship was purchased and renamed Grenville by England on 7 August 1763 in Newfoundland. From 1763 to 1767 English surveyor and explorer James Cook was commander of Grenville, his first independent command. Each summer season he used the ship to survey the coasts of Newfoundland and Labrador, making detailed maps. The following year, 1768, he began his first circumnavigation of the world. The ship was broken up in March 1775. Karl Heinz Marquardt (2003). The Global Schooner: Origins, Development, Design and Construction, 1695-1845. US Naval Institute Press. Sir Richard Grenville, also spelt Greynvile, Greeneville, and Greenfield, was an English sailor who, as captain of Revenge, died at the Battle of Flores (1591), fighting against overwhelming odds, and refusing to surrender his ship to the far more numerous Spanish. His ship, Revenge, met 53 Spanish warships near Flores in the Azores. He and his crew fought the fifty three in a three-day running battle. Many Spanish ships were sunk or so badly damaged that they had to retire from the battle. Revenge was boarded three times and each time the boarders were seen off. Admiral Henry Osborn was a British naval officer who served as Commodore-Governor of Newfoundland. He was a younger son of Sir John Osborn, 2nd Baronet. Lark Harbour is small fishing community on the western coast of Newfoundland, on the south side of the Bay of Islands, and west of the City of Corner Brook. L. A. Dunton is a National Historic Landmark fishing schooner and museum exhibit located at the Mystic Seaport Museum in Mystic, Connecticut. Built in 1921, she is one of three remaining vessels afloat of this type, which was once the most common sail-powered fishing vessel sailing from New England ports. In service in New England waters until the 1930s and Newfoundland into the 1950s. After a brief period as a cargo ship, she was acquired by the museum and restored to her original condition. Chateau Bay is a settlement and bay in Labrador, Canada. Historically it is also sometimes called York Harbour, a name given by James Webb in 1760 when he claimed the harbour for the English. 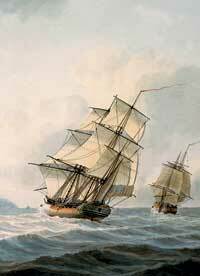 It was surveyed by James Cook in 1763, during his survey of the Strait of Belle Isle aboard HMS Grenville. In August 1766 Joseph Banks arrived in Chateau Bay as a part of a partially scientific journey to study and collect the plants and animals. One of the specimens collected there was the now extinct great auk. Sir Bernard Drake of Ash in the parish of Musbury, Devon, was an English sea captain. He himself refuted any familial relationship with his contemporary the great Admiral Sir Francis Drake, as their dispute concerning armorials reveals. HMS Niger was a 32-gun Niger-class fifth rate frigate of the Royal Navy.